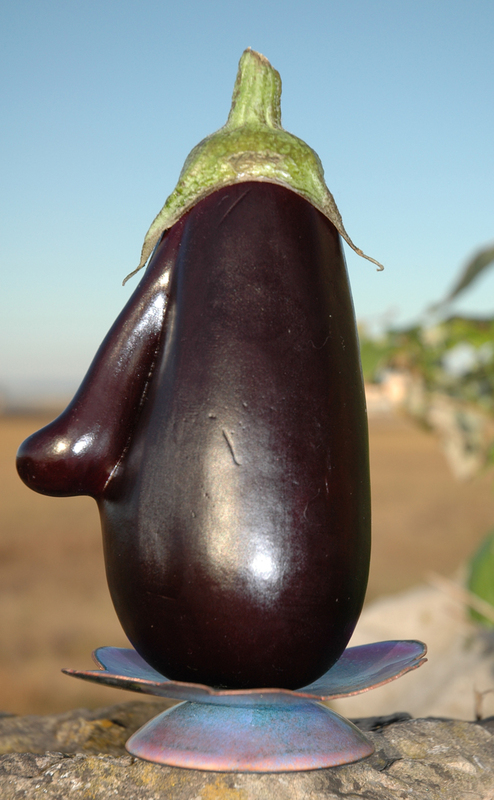 I am imagining that the aubergine I bought yesterday in a wrapped pack of two, from Sainsbury’s supermarket in Whorle, is the love child of my Giant Vegetable Man and Edible Woman ( see my previous post and Flower Show). I think he has his mother’s nose and his father’s chin; the two of them have been shut away for several months in a studio cupboard so who knows what goes on in the dark seclusion of storage? Viewed face – on he has a sort of boyish charm and his hair is really rather cute – it looks as if he may make a good rugby player when he grows up, he already has the broken nose. 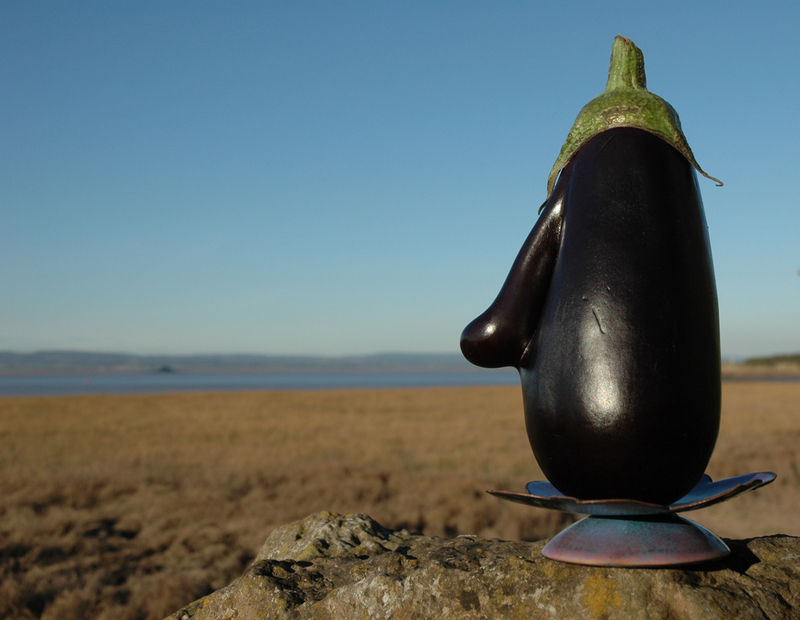 Several people have mentioned his resemblance to an Easter Island figure so here is my favourite photograph of him – on top of the garden wall gazing out over the estuary towards the Welsh hills – I haven’t the heart to cook and eat him just yet. Ratatouille will have to wait. Categories: The Flora Embroideries | Permalink. The secret life of works in progress :))) I looove it! Get that ratatouille cooked , you sentimentalist! 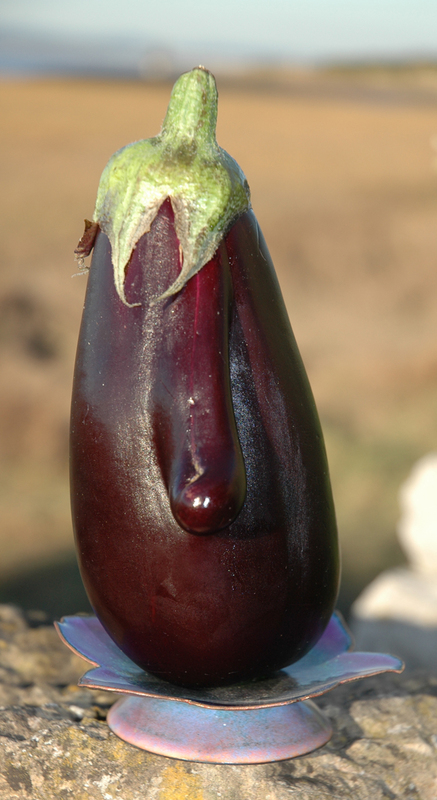 I’ve got some home-grown carrots that are the very opposite of polite, I certainly won’t be photographing them!